Since I'm trying to use ONLY new and untried polishes this month, I have little mini-reviews of the polishes I've used in this manicure! Moving on to the accent colors! 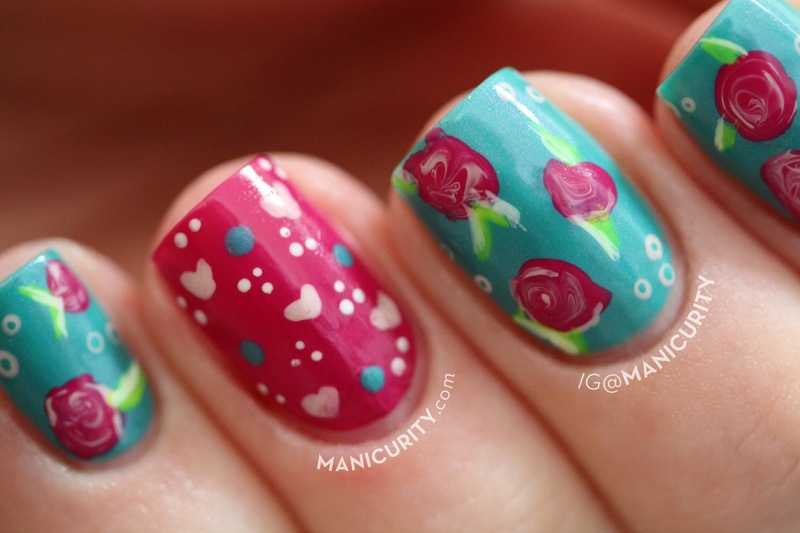 I used Floss Gloss Dinge for hearts, dots, and swirls in my blooms. Dinge is technically no longer 'new' as I used it in yesterday's mani, but wanted to try it for nail art! I thought it was nice, but a little quick drying; this is usually a good thing, but not when you want to do a lot of polka dots or stripes from the same little 'blob' of polish because it can get a little stringy (like the 'spun sugar' effect when you don't want it). For greenery and other accents I used Glowstar and Con Limon; I love both of theses colors in the bottle and am excited to use them as base colors soon. Finally the star of the show for me while painting is *drum roll* Laqa & Co. Nookie!! Before trying this I was all "Really? $11 for a pink creme?" because I am not a 'pink person' and while I looooveee creme finishes I already have OPI Kiss Me on My Tulips as my go-to pink creme. HOWEVER the formula on this is really amazing - this is a serious one-coater. Like luxurious, beautiful, shiny, so easy to control and not patchy one coat hot-pink creme. The bottle feels a little unsteady because it is tall, and the brush is really long (since the bottle is tall) so if you're not careful to wipe it from top to bottom on the inside of the bottle before painting you will get those sudden drops of polish that sort of speed down the brush. BUT this is OPI Kiss Me on My Tulips hotter, older sibling and it comes in a neat artsy box. Love it! I'm not sure my ring finger accent design really matches everything, but I don't really care because it is cute. And it reminds me a little of the cool patchwork quilt-y graphics they're using on a lot of the Sochi 2014 Olympic items (like the banners at the events and the athlete vest things). Have you been watching the Olympics? I've been watching along with all of the prime time NBC coverage, but am impatiently waiting for men's hockey games to start. 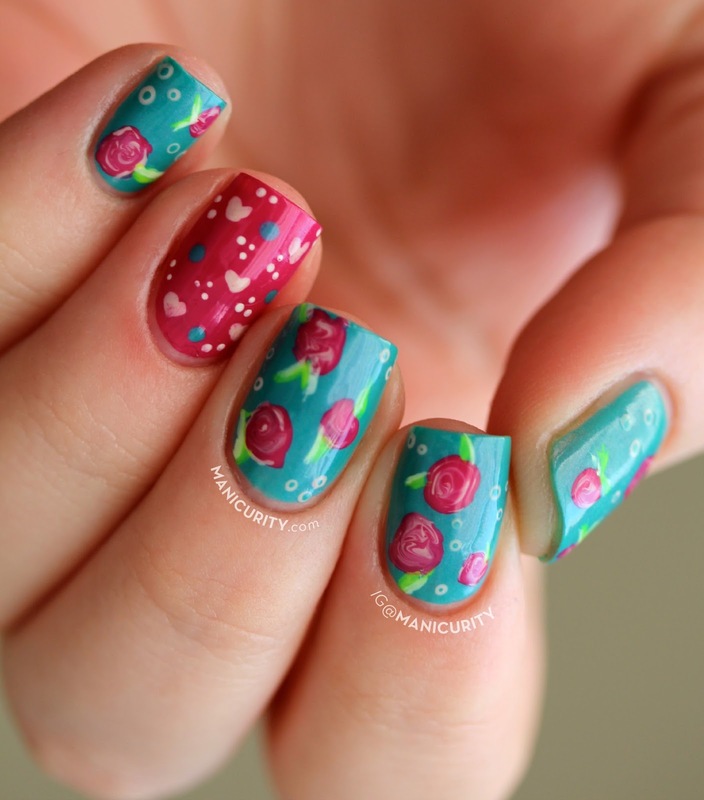 NOW check out the other vintage nails for today! Disclosure: An item in this post was sent as a press sample for my consideration; all opinions are 100% my own! If you would like to know more about my policies, please read my disclosure page. Very beautiful! Love the colors you chose. Loving these :) And I love that you "updated" them, if you will by using the bold colors :) I think I'm going to take that into consideration for tonight's look! 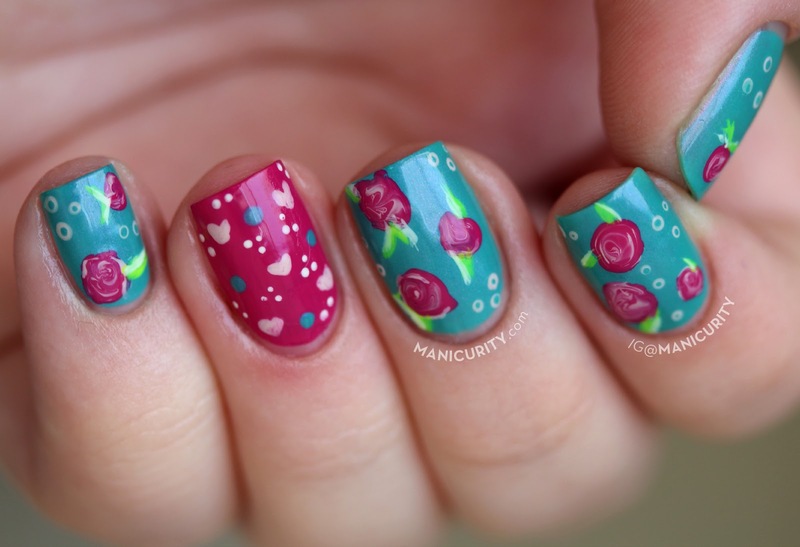 I <3 that accent nail to death! These colors reallllllly mesh SO well! Gorgeous!!! I really have to attempt the roses!!! Love the marble effect on the rosebuds. I love everything about this! 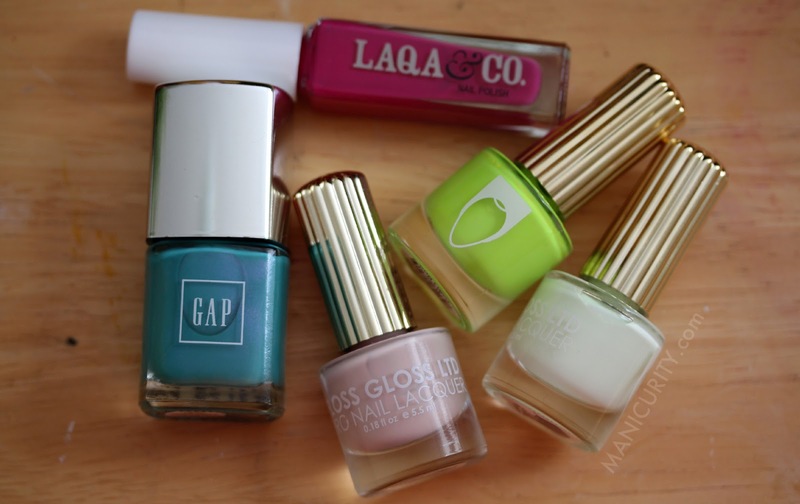 That Gap polish is PERFECT here! Gorgeous! I love the designs and the colors you chose! Perfect!